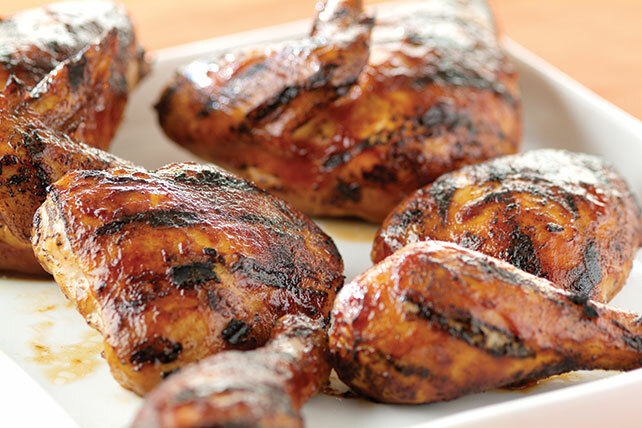 Heat up game day with this Sizzlin' Chipotle Chicken Recipe. This chipotle chicken recipe takes just 15 minutes to prep and a little longer to cook. Preheat grill to medium heat. Trim and discard excess fat from chicken. Sprinkle chicken evenly with salt and pepper. Place chicken pieces, skin-sides up, on grate of grill. Cook 15 min. ; turn over. Brush with half of the barbecue sauce. Grill an additional 10 min., turn over. Brush with remaining barbecue sauce. Continue grilling 5 min. or until chicken is cooked through (180°F).